This is a colorful hand painted transferware plate, c. 1900, from the genre of rabbit ware plates that have become very popular. Very little is known about the actual origin of these wonderfully whimsical rabbit plates. Measuring 10 ” in diameter, the plate is decorated with rich chocolate brown transfer print which was then hand painted in a brilliant green, yellow, brick red and brown, depicting a mother rabbit and her three young ones nibbling grasses in the English countryside. 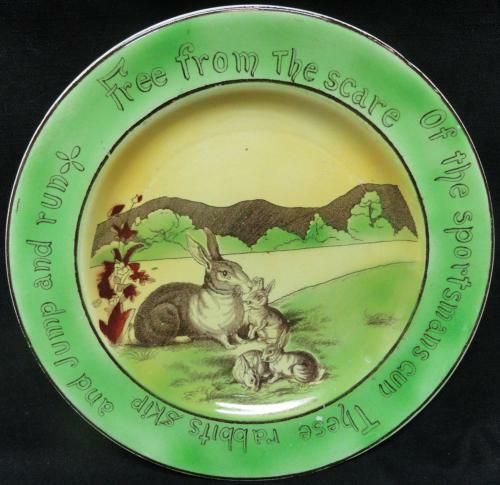 The plate recites the amusing rhyme, “ Free from the scare of the sportsmanship gun, these rabbits skip and jump and run. The plate is in great condition. There are no chips, cracks, or repairs. The piece is well potted and the transfers are richly detailed.